Mercantile Bank Job Circular 2019. Bangladesh Privet Commercial Bank Mercantile Bank Career Opportunity 2018 has been published Chief Financial Officer (CFO)jobs circular 2019. We are published there circular this website. Mercantile Bank is the best commercial and modern banking sector in Bangladesh. Every year they are published many jobs circular for this Bank. So if you want to billet your career you can apply for these jobs. There is Chief Financial Officer post is taken this circular. Male and female are bought can attend this post. So if you want interested in these jobs you can apply for these jobs. Recently All Govt Bank Jobs Circular can be here. Recently Bank has been published Marketing Officer (MO) Jobs Circular 2019. So if you want to interest this job circular you can see this information here. We also will be given here Mercantile Bank Limited jobs exam result and exam seat plan here. So if you want to download this information can be all information on this page. Mercantile Bank Limited, is a leading private sector commercial bank rendering financial services with an array of products matching the requirements of multiple segments of clientele. The Bank is well equipped with state-of-the-art technology, professional team, geared to provide quality services through its network of 109 branches. 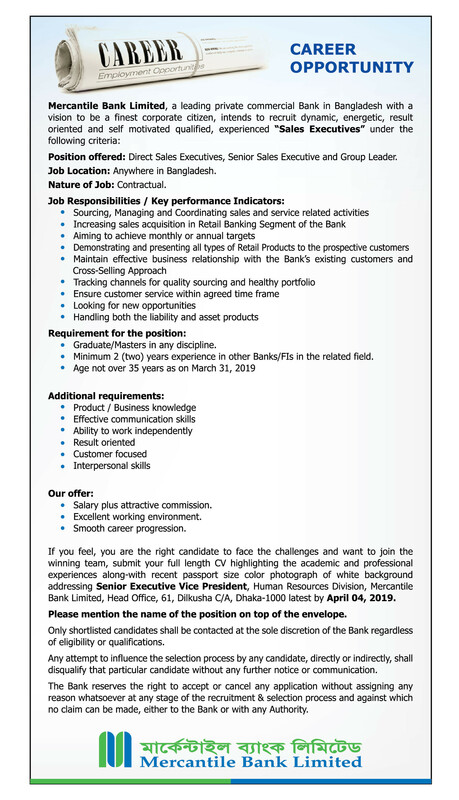 The Bank seeks to employ a person with the following qualifications and experience. Now we have given Mercantile Bank Jobs Circular all updated information here. So you can download all important for this opportunity. See Mercantile Bank Jobs Circular 2019. Educational Qualification A recognized professional degree i.e. FCA, FCMA, CFA, MBA in Finance/Accounting. He/She should have a strategic mindset and prudence to give solution on multidimensional financial matters with an aptitude of innovativeness to produce excellent financial reporting. Mercantile Bank limited jobs result will be published after the exam. When will be result published then you can see your result here. We are found your result here. We also gave exam preparation on our Facebook fan page so you can visit our page and gate more tips for your job exam.